Since it's "Martha Week" at Macy's (with Martha Stewart Collection products on sale) I thought I'd select a few of my favourite items from this summer's collection. My selection is always about instinct - what I'm drawn to intuitively - and it seems I'm in a very navy/nautical/Americana kind of mood these days: stripes, graphic nautical prints and a definite nod to al-fresco living. Below are a few of my choices. Like many of you, I love the new Whim collection by Martha Stewart at Macy's. I think the patterns feel so fresh and vibrant, youthful without being 'juvenile.' 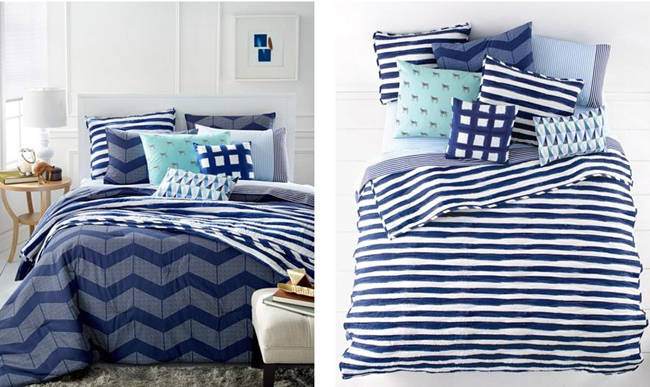 How nice would it be to outfit your bed with this navy and white motif from the Whim collection called "Different Strokes." Mixing stripes with checks and linear with chevron, your bedroom will get an instant summer lift, as fresh as a sea breeze. 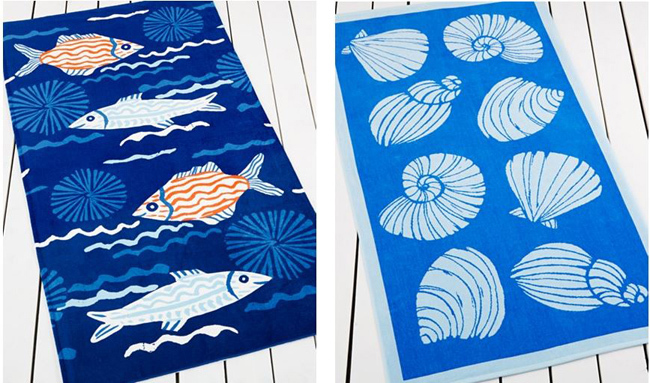 I have a thing for graphic beach towels. I'd love to add these fruity, summery styles to my collection! They measure 38" by 68" (big!) and are made from 100% Turkish cotton. 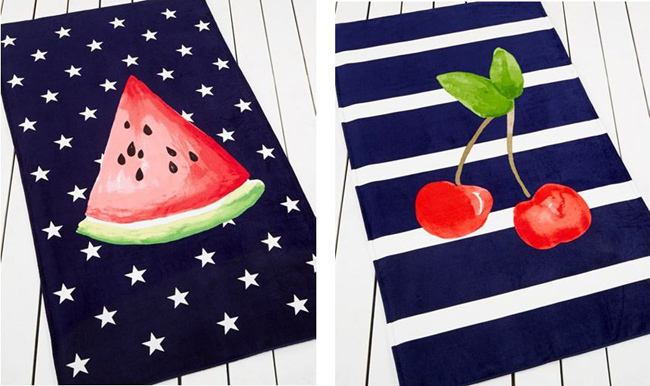 Above, the watermelon and cherry motifs, with the stars and stripe backgrounds respectively, have subtle nods to Americana: perfect for a Fourth of July beach party. Below, more nautical patterns with fish and sea shells. And while you're at the beach, why not take a deluxe picnic basket stocked with all your favourites? 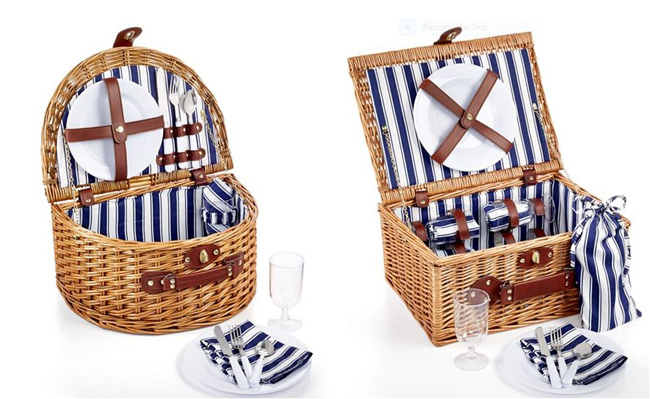 There is a basket for two (left) and a basket for four (right) complete with cotton napkins, 9" plates, wine glasses and sets of cutlery: forks, spoons, knives. The basket itself is made of wicker with leather trim details. In the kitchen, it's easy to bring some summer energy into this very busy room. 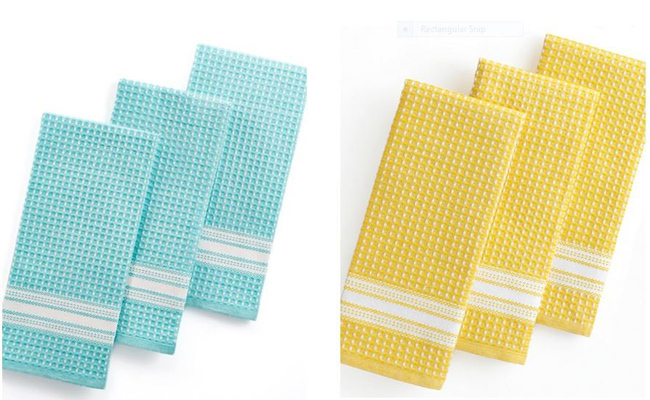 Start with the basics: dish towels in light, summery colours. These waffle-pattern sets are highly absorbent and come in threes, in several different solids. I chose the sky-blue aqua and the sunshine yellow. Since I'm out a lot during the summer days - at work, mostly, but also at the local parks - I often like to bring lunch with me. I love this ''Salad to Go" food storage container, which comes with a small side jar for salad dressing and a plastic fork and knife. And who wouldn't love a perfectly round 'ice sphere' in their drink? This innovative mold shapes your ice into the perfect round for elegant cocktails. Be sure to visit Macy's before June 7th to catch the Martha Stewart Collection sale, or shop online at Macys.com. If these new waffle weave towels are anything like the MS towels I already have, they are major absorbent and retain their shape - they get laundered many times and always come out of the dryer like new. And I love, love, love the gigantic round ice cube mold. I need to take a field trip to Macy's and stock up!